Web-based medical system for doctors. Your practice can have its own, customized web site and your colleagues can book appointments. If you already have your own webpage you can add our online booking system to your own webpage. 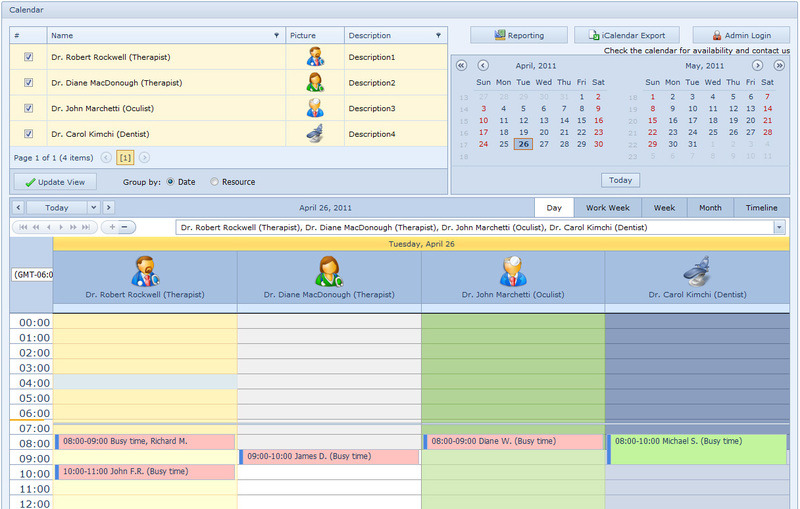 Are you struggling to keep control of your appointment-scheduling process? Medical Booking Service can help your office become more efficient and free your staff to conduct more important tasks. Medical Booking Service is the perfect web-service for both one-person practices and those with multiple locations and many medical providers. Because it works through the Internet, you don't have to worry about the expensive and troublesome issue of trying to network all of your computers. You can use the web-service to show hourly availability. You can have time slots availability and booking calendar on your website within minutes. Each doctor can create a profile to run his personal schedule. You can instantly switch between profiles to view the schedule of any specialist at any given moment. You will have a single place to manage all calendars. Each calendar may have its own options and administration pages. The Medical Booking Service is designed to enable the communication between different scheduling applications over the Internet. It facilitates data transfer between applications that use Scheduler and other applications, such as Apple iCal, Google Calendar, Microsoft Exchange Server, Microsoft Office Outlook 2007, Novell GroupWise, Windows Calendar. You may obtain a collection of days which are treated as holidays for the specified country, and add these holidays to the scheduler. The Report Designer provides end-users with the capability to edit reports, load and save report templates, and preview and export to various formats (including PDF, XLS, RTF, MHT, HTML, Text, CSV, and BMP). Our programs are cross-browser compatible and are carefully tested on multiple browsers to ensure utmost compatibility. booking,online booking,web booking,medical booking,medical online,online booking,medical software,booking software,booking for doctor,online appointment,doctor appointment booking Web-based medical system for doctors. Your practice can have its own, customized web site and your colleagues can book appointments. If you already have your own webpage you can add our online booking system to your own webpage.